Do You Need a Montessori Routine for Infants? 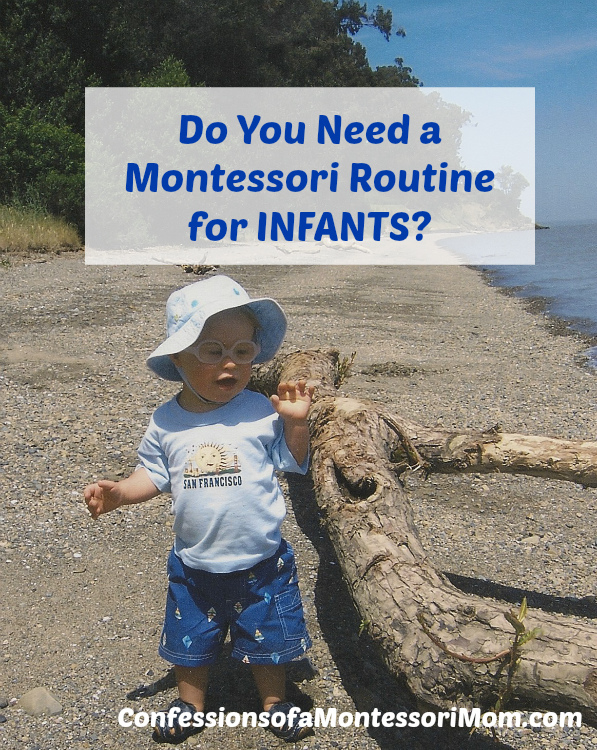 What type of Montessori-friendly schedule should you have for an infant? And how many different activities should they do? And do you offer the same activity just once per day or multiple times? I get asked these types of questions a lot! 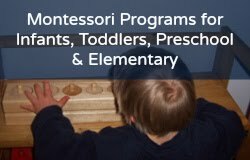 I don't have Montessori-style schedules for tots under the age of two because their development changes so quickly. Instead I always recommend having the following routine: sleep, eat, play--do activities, then go outside or to the park (for large motor movement). Sleep again (morning nap), then eat, then play--do activities, etc. When a tot outgrows a morning nap, you can extend the play--activities and the outside/large motor movement time before you have lunch (which would be around 11:30 at a daycare or school). As for how many activities, you can have as many as YOU can manage, because you'll be the one to clean them up! I used to have seven per room (seven in the living room, seven in the upper hallway, seven in my son's room when he was an infant). You can have more than that, it's up to you. Allow the infant to explore them at will, so have them all out at once--in each room that your infant has access to, all day and evening. You can introduce an activity when your infant shows an interest in it; as well as when you make or buy a new activity, you can introduce it to the infant then. As for the infant's interest, the best times of the day are: mornings after the infant has been changed and fed; same for afternoons--after the infant has taken a nap, been changed, and fed. As for night time, it is OK before bedtime, after the infant has been fed and changed. Some infants/toddlers are very active before bed and need activities to do in their room (simple ones!). Clean up: the best times to clean up the activities are when the infant is busy eating and or sleeping! Otherwise, the infant will just undo all your clean up! You can change what the infant chooses by what you put out in each room. Messier activities can go in or near the kitchen, quieter activities including books in the bedroom/sleeping area, challenging activities in the family or living room. You want to be able to see the infant so you can observe him: what are his interests? what milestones did he reach? what frustrates him? what does he choose the most? the least? And use your observations as your guide!